In his TED talk on the UCLA campus in July of 2014, Reeve Foundation board member and T9-L1 para Mark Pollock sat tall and strong as he explained to a rapt audience what it is like to be blind, paralyzed, and operating in the “domain of the unpredictable.” This is his world, he said, because no one knows where the search for recovery from SCI will ultimately lead. The most promising and practical therapy, he believes, will likely be “a cocktail of cures.” And the search for that elusive technology is why he came from his home in Northern Ireland to UCLA in the first place. [“Rob Summers: From Quad to Para and Beyond?,” Sept. 2011; “Cure Research: Looking to the Future,” Mar. 2013] and led to the Reeve Foundation’s latest research/fundraising initiative, “The Big Idea,” [Dec. 2014]. These new trials taking place at UCLA are part of a five-year NIH grant in its second year. “We’re trying to find what are the most optimal sites for stimulation,” says Edgerton, “what kinds of improvements they bring and what we are going to be able to achieve.” The upper limb trial involves six subjects, and a lower limb trial also involves six subjects. Their main purpose is to test a new stimulation technique that delivers electrical impulses transcutaneously to the spinal cord rather than via an implanted array of electrodes. The obvious advantage to this new delivery system is its potentially broad application, its timely feasibility, and improved cost. Edgerton says with sufficient funding he thinks a transcutaneous system could be ready for marketing in two years [see below]. The most novel of trials is the one involving Pollock, who traveled from his home in Dublin to UCLA with his own Ekso Bionics robotic system, the first purchased by an individual, which he obtained in 2012. “My Ekso transmits all data back to a lab in San Francisco — number of steps, time, all the data,” says Pollock. “Using it from 2012 to 2014, psychologically I felt better standing and walking and felt physically better. 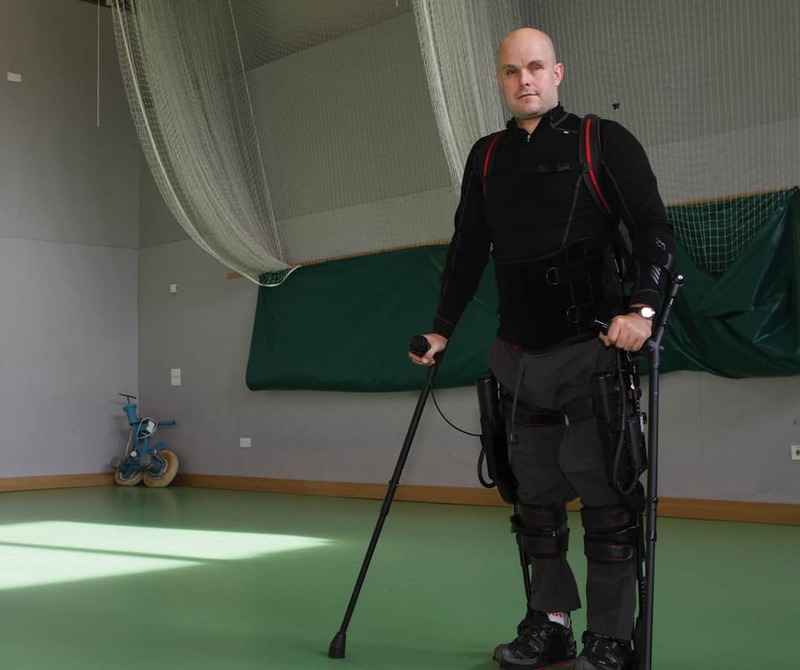 But I couldn’t say there was any neurological recovery.” Edgerton likes this exoskeleton because it allows the user to take over some or all of the workload with his or her own muscle power. The hope is that adding stimulation will facilitate incremental recovery. Mark Pollock tests his Ekso Bionics system in combination with a transcutaneous stimulator monitored by UCLA’s Yuri Gerisimenlo. From February through May 2014, Pollock participated in a number of tests — walking in his Ekso and gathering data; then adding transcutaneous stimulation while walking in his Ekso and gathering more data; then taking the monoaminergic drug while Ekso-walking; and finally, combining all three modalities. “Training and regaining” is tied to the concept of neuromodulation. “We have pretty good evidence that neuruomodulation changes the physiological properties of movement we want to improve,” says Edgerton. “The neuromodulatory procedure [adding stimulation to activity such as stepping or grasping] changes properties of the neuronal system, and this enhances the system’s ability to perform. The circuitry of the cord must be neuromodulated, or re-educated, in order to improve the practical response.” That is the scientific way of saying the spinal cord has intelligence and can remodel itself. On February 19, a consortium organized by the National Institute of Biomedical Imaging and Bioengineering, the newest NIH institute, held its second meeting with the goal of doing just that — fast tracking the research to move it to the public domain. According to Edgerton: “NIBIB is putting a high priority on trying to figure out the best ways to move the present technology to the SCI population as effectively and quickly as possible.” While the consortium’s main goal is to translate the latest research results into practical use, they are also proposing to organize specific trials on the use of epidural stimulation to improve bladder function. Edgerton says they hope the epistim/bladder trial will serve as a way of not only addressing another important quality of life concern for people with SCI, but also function as a test of the consortium as a model of future effectiveness and collaboration. The medical device adapted for use in the Louisville epidural stimulation trials was an off-the-shelf implantable stimulator made by Medtronics for pain control. Now the race is on to bring an improved next-generation epidural stimulator, as well as a transcutaneous stimulator, to market. Nick Terrafranca, CEO of NeuroRecovery Technologies, says the need for more highly programmable electrical stimulation devices was the catalyst for the startup of the new company, whose scientific team, led by UCLA’s Reggie Edgerton, includes Yuri Gerisimenko, Roland Roy, Parag Gad and Wentai Liu, also of UCLA. Rounding out the team are Joel Burdick and Y.C. Tai of California Institute of Technology. The company hopes to have improved stimulation devices ready for widespread use within two to five years.